Not sure where I have got to with the updates regarding the Dyer’s Chamomile. 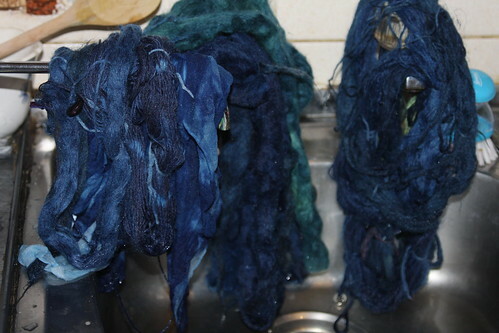 Finally finished the fourth dye bath last night – the shades have been fantastic. I have four distinct and separate ones, which I will write up for you when I have taken a proper photo. The weather has defeated me over this.. SNOW… hits Bristol and Wales. Good news and bad news. I have some commitments at the start of next week, and this will cause a bit of a chaos if I cancel at late notice on Sunday night/Monday morning as people are coming to stay to be nearby and the hall and rooms are booked and there will be no refund on the booking fees if no notice is given. I have rung around this afternoon those I can reach, and it seems the most sensible thing is to cancel – so sorry for any disappointment – finger’s crossed that those I have not spoken to will be reading this blog before Monday. We will reschedule as soon as the forecast clears. But the good news is that I have time to play today…. so out came the Indigo VAT. Oh I had so forgotten that smell !!!! all the ventilation possible was going, but the house reeks and the dog – he has crossed me off his favourites list for sure. So I have read both DT Crafts and Fiery Felts booklets and examined the kits with curiosity and suspicion – totally in awe. Could it really be as easy at it looks? (remember I have “done” madder…which had totally intimidated me for ever…). So starting from DT Crafts kit – I followed the instructions (using the strongest concentration of indigo extract recommended – 20g) and I achieved a quite respectable looking “flower” or crust on the top of the vat after the hour. The colour wasn’t turning the bluey-green though as recommended, so added an extra teaspoonful of Thiourea Dioxide and waited, x 3 until a respectable blue-green was underneath the crust. The PH was 9 – so I decided to start dyeing. 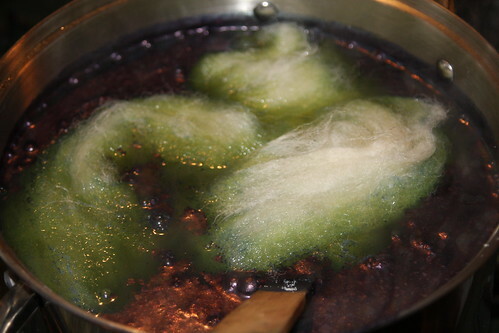 You can see from this picture as I started to immerse the fibre, I had problems with the pre-wetted wool just not wanting to sink, you can see though how gloriously green the dye was just under the copper blue surface. 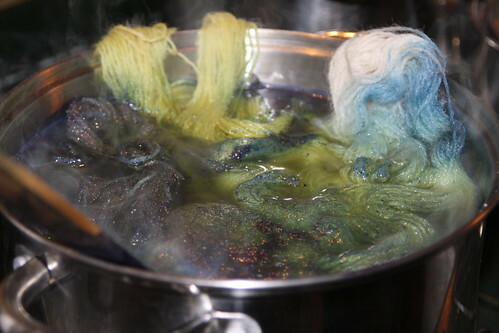 When I extracted them after 20 minutes, they were quickly turning dark indigo, before even leaving the sink, so I placed a second dye bath in containing greys and some of the madder which hadn’t been very pretty from the previous dye baths, hoping for some interesting shades. and wow…it does though seem that the darkness of the blues has overtaken all the underdyed stuff, but wasn’t that keen on the madder, and this is truly spectacular. I can honestly report though that both these kits together and detailed booklets have given me a 3D experience of the dyeing, in a way that I wouldn’t have with either book by itself. Having the “stuff” in front of me to make the vats certainly gets me off my bottom and stops procrastination. If I had ordered the booklets and then had to buy the stuff, I probably wouldn’t have got this far. The Fiery Felts kit needed caustic soda and washing soda, both of which I have to hand in the house, so that didn’t present any problems at all. I again, realise that I have made jolly hard work out of a process which should have been very simple. 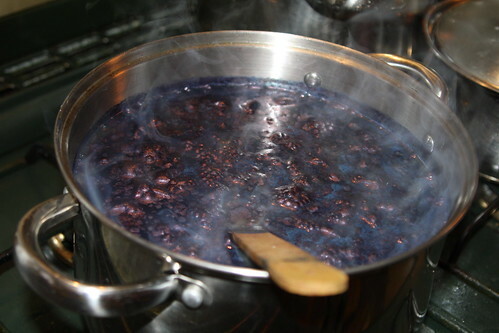 I have re-written the recipes in the order that I understand them, and after having a go with the woad will return to the indigo I suspect to try to get the lighter shades – not sure what is in the dye bath though, so that should be fun to find out !! I simply don’t have enough experience of cooking I have concluded.